As I sit here and write I find myself wishing that the themes brought up in Don Nguyen’s The Commencement of William Tan were a thing of America’s historical past. That members of our minority communities no longer face the difficulty of attempting to assimilate into a surprisingly hidden homogenous culture that we call the American “melting pot.” That students are no longer ostracized for their difference within our education system. Where even within the ivy entrenched walls of America’s oldest and most prestigious university, students of color are receiving death threats for exercising their American right to speak out against silly and immature moments of racial discrimination. That violence no longer erupts when these cultural and racial differences become inconsolable. But as we see and continue to see, America fosters an environment where violence and self-destruction continues to clash between those scrambling for that piece of the American Dream and the causalities are often the youngest among us. Unfortunately, our community has become the latest battle ground for a feverish nation. As the facts of Saturday’s Halloween incident continue to come out, and the wave of anger passes, we are left with a simple fact, that students of color do not feel safe in the one place where they should, their schools. Though we are continuing to grow in our understanding of our collective cultural background and what it means to be American, too often in recent memory is that understanding scattered because of violence that we are exhibiting to ourselves. 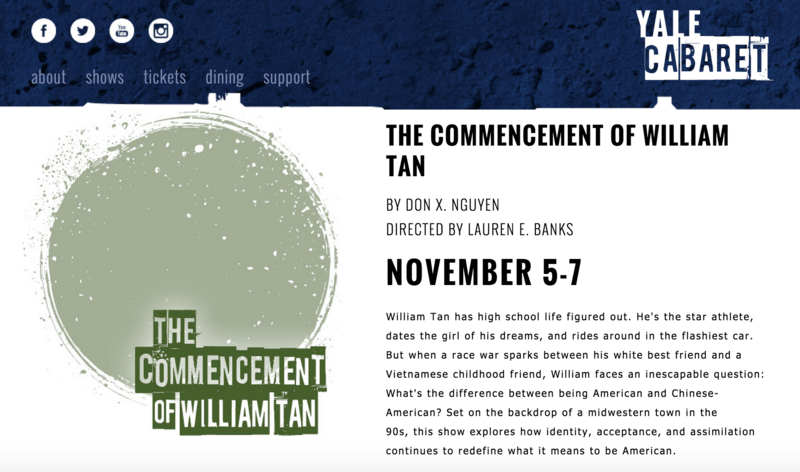 Second-year actor Eston Fung and third-year dramaturg Ashley Chang proposed The Commencement ofWilliam Tan with a passion and a drive that was infectious. They came with a charge, to lead a conversation of representation of Asian artists both on stage as well as within American culture. Though this play was set in over 25 years ago and hundreds of miles away, it is now sadly timely and poignant to Yale University. However, as in William Tan there is a charge: an act of selflessness from everyone will finally force us to see each other as we are, humans living in America and bounded to a dream that we have the right to life, liberty and the pursuit of happiness without the tyranny of oppression.